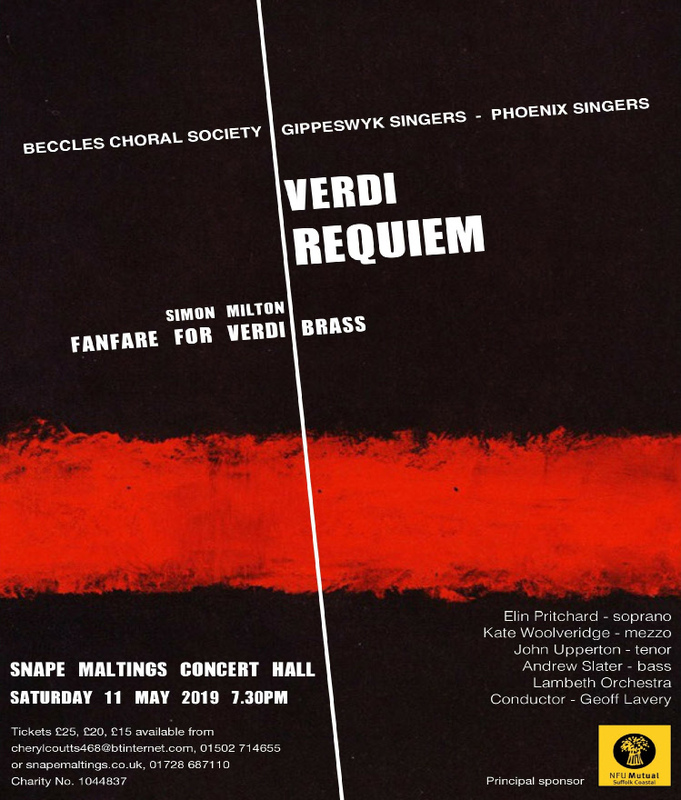 Gippeswyk Singers, Phoenix Singers and Beccles Choral Society are delighted to announce they will be joining forces under the musical direction of their conductor Geoff Lavery. Thundering drums and heralding trumpets of the Lambeth Orchestra will have you tingling from head to toe as they join a magnificent massed chorus and 4 outstanding international soloists in filling the wonderful acoustic at Snape Maltings with glorious resonance. Verdi’s operatic skill shines forth in his Requiem creating an unforgettable choral masterpiece filled with great lyrical beauty and dramatic passion. Gippeswyk Singers and Beccles Choral Society have previously collaborated with Lambeth Orchestra at Snape Maltings for a sellout performance of Elgar’s “Dream of Gerontius” which received tremendous reviews in May2017. Conductor Geoff Lavery has recently become the musical director of Phoenix Singers (Framlingham) and is now in the unique position of being able to seamlessly rehearse and coordinate a phenomenal chorus of 200 singers accompanied by the superbly talented 80 piece Lambeth Orchestra(leader Alan Thorogood).